I found this really cool....I mean ECO-Cool...Remodel Tool through an article on Treehugger.com. The Eco-Cool Remodel Tool is one of several green tools on the website for King County, Washington's Solid Waste Division's website. This neat web-based Tool lets you select an area of a model green home to reveal ideas and tips for environmentally-friendly renovations. •Use permeable materials for patios, walkways and paths such as clay brick, rock or concrete pavers, broken concrete, recycled glass pavers, crushed rock, wood chips, nutshells, and tumbled recycled glass to help minimize runoff and flooding. Impermeable (non-porous) surfaces such as concrete patios and paths do not allow rainwater to naturally percolate into the soil. •Select native plant species. They are adapted to your area, many are drought-tolerant, and most do not need additional fertilizer. •Certify your backyard as a Certified Wildlife Habitat through the National Wildlife Federation. Create a backyard habitat that will attract beautiful songbirds, butterflies, frogs, and other interesting wildlife for viewing from your very own window. •Install water-wise or drought-resistant plants. •Use pest- and disease-resistant plant varieties. •Use mulch to protect plants and conserve water. •If your house is on top of a hill or other breezy location, plant trees or shrubs to block the prevailing wind. This will help reduce cold air infiltration. 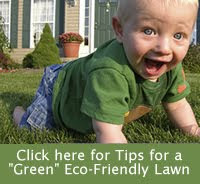 •Minimize the amount of lawn in your yard. •Automatic sprinkler systems waste about 30 percent of the water they deliver. It is possible to design a landscape that minimizes the need for regular supplemental watering once the landscape is established. ◦Soaker hoses and drip irrigation are good alternatives to permanent in-ground irrigation systems. Soaker hoses are made from recycled plastic and are inexpensive. Drip irrigation systems apply water directly to the soil through tiny emitters so they allow for more precise watering to match the needs of specific plant types. ◦If you choose to install a permanent in-ground irrigation system, look for piping made from polyethylene, as opposed to PVC. •Install a weather-based irrigation controller that automatically adjusts the watering schedule according to the weather. •If your garden hose leaks at the spigot threads, try to install a rubber, round-edged washer instead of a flat-edged washer. You can minimize potable water use by storing roof rainwater for later use in the yard. Whichever system(s) you choose, you will be helping to reuse water that would normally go to waste in a storm drain. First, reduce your water consumption, then invest in harvesting systems. •Water can be stored in rain barrels, cisterns or rain gardens. •Cisterns are large tanks that can store hundreds to thousands of gallons of water, enough to significantly reduce or eliminate the need to use municipal water for landscape purposes. •You can also put roof water directly to use in your yard with a rain garden. Rain gardens feature plants that thrive in wet conditions coupled with soils that allow safe ground percolations. Rain gardens must be carefully designed and located to avoid flooding. I recently heard a promo for a green living radio program segment and the person quoted said something like "the greenest building is one already built" suggesting that re-purposing and remodeling a building may always be the greener way to go than starting from scratch. I also heard that sometimes the oldest building is the greenest- any thoughts on this? Hi Judy. I think that people define green in different ways and it is difficult to give a firm answer on this. In my opinion, the answer would depend on how old the current home is and how well it was originally built. "Green" building encompasses many facets including energy efficiency, water conservation, indoor air quality and sustainability. Certainly re-using an older building will conserve manufacturing energy and materials. However, newer buildings are built utilizing new technologies that improve on older technologies, creating homes that are much more energy efficient, stronger and many times contain less toxic chemicals in their production. Although certainly not comparing apples to apples, you can compare them to cars. A new car certainly requires a lot of manufacturing energy but new requirements create a vehicle that is much more "planet friendly" than an old one.